$5 DISCOUNT THROUGH MARCH 26! 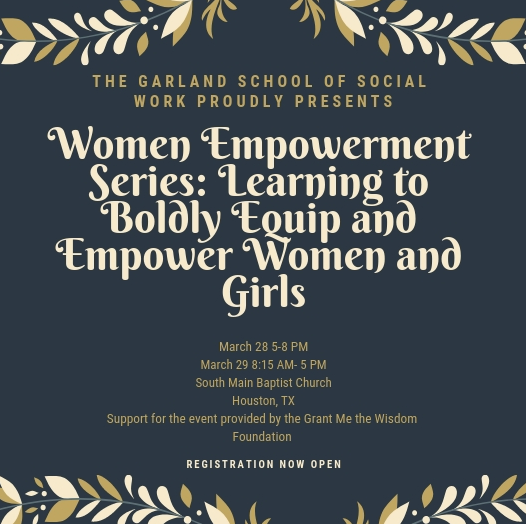 Baylor University’s Diana R. Garland School of Social Work (GSSW) will host a Women’s Empowerment Series conference at its downtown Houston campus March 28-29, with the goal of equipping practitioners and professionals across various disciplines in best practices that empower women and girls. The “Women Empowerment Series: Learning to Boldly Equip and Empower Women and Girls" will include topics focused on empowering women and girls in areas of mental health, leadership and mentorship, and congregations. Thursday evening’s agenda will feature keynote speaker Anna Coffey, CEO of The Women’s Home in Houston. Coffey has a background in social work, public health and law. She has served women in a wide range of roles from working with rural women in West Africa to helping women make smart decisions about health care. The Grant Me the Wisdom Foundation and the Garland School of Social Work are sponsoring the two-day event with the GSSW’s SERVE (Serve Encourage Respect Value and Empower) Project team taking the programming lead. The team, consisting of six students in their final year of the Master of Social Work (MSW) program and GSSW faculty, will lead a Q&A panel on Friday afternoon focused on the students’ research related to women and girls. Friday will also feature speakers focused on human trafficking, supporting women and girls in congregational settings, best practices for the prevention of clergy sexual abuse and a lunch session led by GSSW Dean John Singletary and Associate Dean for Research Dr. Holly Oxhandler, on empowering women leaders. Grant Me the Wisdom is a Houston-based foundation providing grants to organizations both in the US and abroad primarily focusing on education and health care for women and girls in the developing world. Baylor’s SERVE Project team currently leads a $100K+ grant, provided by the foundation, engaging advanced standing MSW students in serving women and girls and working for social and economic justice on their behalf. The Empowerment Series will begin Thursday night at 5 p.m., and continue through 4 p.m., Friday. Baylor’s GSSW campus is located at South Main Baptist Church at 4100 S. Main St. Tickets are $25, which includes CEUs, and can be purchased at bit.ly/empowerBU. For more information, please call (346) 701-8050, or email Haleigh_Culverhouse@baylor.edu.